Happy New Year from the Pooping Pig! Something festive found on ebay. More New Year Pigs here. And here. And here. And here. A vaguely threatening vintage Thanksgiving card found on ebay. And a little old fashioned turkey day link dump here. Let's come to the point; be my valentine! His friend the Fire Eater Valentine. 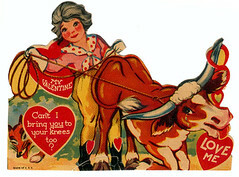 A vintage valentine extolling the virtues of smoking. How to prevent your boy being killed on the Fourth of July -- kill him on the Third. A high old time on the Fourth. Fresh from ebay, a charming portrayal of animal torture in times gone by.